Before acquiring the Aquarius project from Eastern Radofin, Mattel Electronics tried to offer a cheap alternative to the original project, named Keyboard Component, proved too ambitious (and expensive) compared to competing products, aimed to the emerging market of home computing. So it was that a very interesting object came to life, named ECS: Entertainment Computer System. ECS was a form of expansion of the famous Intellivision. It was connected to the console as if it were a (enormous) game cartridge. Once connected, it was perfectly joined to the main console case, looking as a natural extension of the original hardware. The module, called Computer Adaptor, included 2KB of memory, expandable up to 16KB, a ROM built-in BASIC interpreter, a second chip dedicated to sound, able to add 3 audio channels, a port for connecting a datassette (standard type of recorders) or to connect a thermal printer, also used for home computer Aquarius. Following the success of Atari, undisputed forerunner of the video games home market, in the late 70s, Mattel (well known for the Barbie) inaugurates the Electronics Division, author of the console that was the first real rival of Atari 2600: The Intellivision. 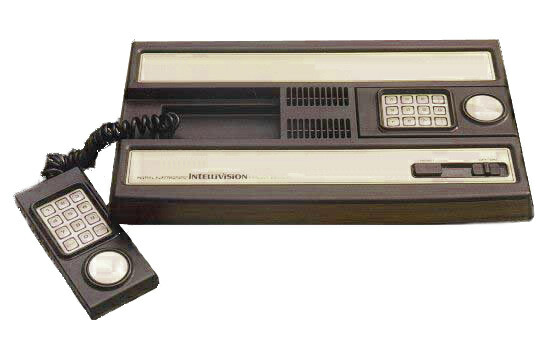 In late 1979 system testing was completed, and Intellivision was released starting from 1980. The configuration was not just stuff. In fact it was the first home entertainment system with a heart at 16 bit! The microprocessor inside the console, was a General Instrument CP1610 at 895 KHz (less than a MHz!! ), which was backed by 1352 bytes in RAM (little more than A Kilobyte!! ), a dedicated graphics chip, called STIC (who had 1KB of dedicated RAM), able to operate at 160 x 196 with 16 colors and 8 sprites, while the sound, managed by a General Instrument AY-3-8914, was capable of 3 channels + 1 for white noise, in mono.